Slip into a pair of completely waterproof Rugged Shark® Great White Deck Boots and here’s what you’ll feel. The first thing you’ll notice is they fit your feet like a comfortable pair of boat shoes. That’s because we designed them that way. And hey, they have arch support and a cozy, removable, contoured footbed that cradles your feet, just like Rugged Shark boat shoes. Go ahead, stand up and walk around a little. WOW! They have cushioned midsoles and extra cushioning in the heels—a special sponge rubber cushion to be exact, so these Sharks can absorb shock while you’re busy dancing around a pitching deck, dodging the boom on a starboard tack, bouncing tuna fish off the cockpit sole or spending hours casting from the bow of a bass boat. In addition to all that custom-fitted interior comfort and wonderfully cushioned ride the Great White features real Rugged Shark boat shoe outsoles. The bottoms are molded from our exclusive, non-marking rubber compound and utilizes our trademark “groove and channel” design that pumps water out from under your feet and grips wet decks like a Ferrari on a tight curve. The outsole even rolls up over the toe and heel to grip when you’re kneeling and they even have Shark Teeth ribs in the recessed arch to reduce the fear factor when climbing the ladder to the fly bridge or tuna tower. These aren’t your father’s deck boots, son. These are the Rugged Shark of deck boots and you’re going to love them so much you just might catch yourself wearing them around the house! All rubber vulcanized construction provides flexibility & waterproof construction. Removable water friendly footbed. 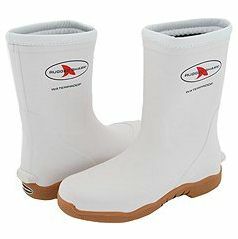 Shark Grip (TM) slip resistant, non-marking rubber outsole. Outsole heel helps provides safety on ladders.